History: (Thor I#301 (fb)/Spectacular Spider-Man Annual#8/3) - Aware that in a thousand years the Fourth Host of the Celestials would judge humanity, Gaea led the goddesses of Earth in gathering the finest examples of humanity, including Kiana from Alaska (11th century), Bridgit O'Hare from Ireland (12th century), Mira from Ruk Island (15th century), Gregor Buhkarov from Russia, Chandra Ku from Africa (both 18th century), Catherine Moranis from Ottawa, Raoul Hernando from Colombia (both 19th century), Mark Cadmon from Chicago (1919), and Jawaharel Patel from India (1948). These 9 "Young Gods," were kept them in suspended animation and kept watch over by the goddesses the until the Fourth Host's arrival. (Thor I#203 (fb)) - Heimdall and Kamorr were charged by Odin to gather the last three of the Young Gods, and found them in Carter Dyam, an Israeli soldier, and Chi Lo, a Japanese fisherwoman. They brought them to New York while they sought out the last of the Young Gods. (Thor I#202) - Heimdall and Kamorr met Jason Kimball, and saved him from Baker, a man he owed money to. They brought Kimball away with them. (Thor I#203) - Heimdall and Kamorr brought Kimball, Dyam and Lo to the scene of a battle between Thor and Ego-Prime. When Ego-Prime attempted to destroy Thor and his comrades with a blast of energy, its energies were instead drained into Kimball, Dyam and Lo, unlocking their godly potential. They were then brought up into Asgard by Odin to prepare them for the coming of the Fourth Host. (Thor I#300) - The 12 assembled Young Gods were presented to the Celestials by Gaea, and Arishm the Judge determined that, based on them, humanity should endure. The Young Gods were all taken aboard the Celestial Mothership with the Fourth Host. (Spectacular Spider-Man Annual#8 (fb) - BTS) - The Young Gods were placed into the charges of Juniper and Katos. Juniper taught Sea Witch, Highnote, Daydreamer, Mindsinger, Brightsword and Splice in the ways of offense, while Katos trained Varua, Genii, Moonstalker, Calculus, Harvest and Caduceus in defense. (Spectacular Spider-Man Annual#8) - While the Young Gods were training aboard the mothership, they were spied upon by the High Evolutionary and Daydreamer became convinced that they should become involved to protect humanity from his intentions. 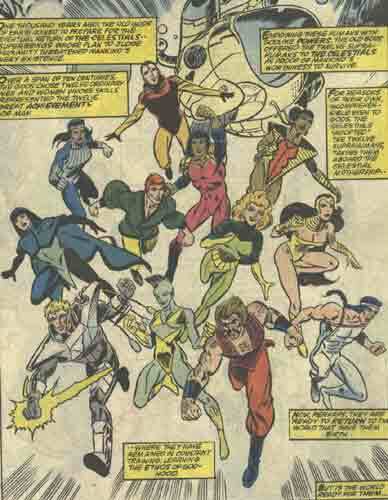 Mindsinger, Daydreamer, Brightsword, Splice, Sea Witch and Highnote all set off to Earth and fought Quint and the Gatherers alongside Spider-Man, until Calculus, Varua, Genii, Harvest, Moonstalker and Cadueceus came after them and the two sides fought each other, until Daydreamer accidentally harmed Calculus with her powers. After Caduceus healed Calculus, the Young Gods all stood down and returned to the mothership. (Spectacular Spider-Man Annual#8/2) - Mindsinger, Daydreamer, Harvest, Varua, Genii and Brightsword visited Jerusalem, Israel, to investigate a psychic presence Daydreamer had detected. They discovered an artificial creature powered by the emotions of the people there, but Varua, Harvest and Mindsinger were able to form a Uni-Mind and cut it off from the emotional energies, forcing it to consume itself and die. Daydreamer examined the creature's remains and determined that it had been sent by one of the gods from Earth's pantheons. (Spectacular Spider-Man II#168-170) - Calculus manipulated the Space Phantom, Avengers and Spider-Man into removing the threat of the "black cloud" (black insect swarm) from Earth, using mathematical probabilities to manipulate the outcome. Only Spider-Man was aware of Calculus' involvement. (Marvel Comics Presents#101-109) - When Sea Witch had a prophetic dream, Daydreamer and Varua determined that it was related to the encounter they had had in Israel before, and the Celestials permitted them to return to Earth and investigate. They split into three teams, visiting Sri Lanka, Ireland, and Central Bend, Wisconsin. The rogue god Nauda proved to have been the creature's master, and was seeking 3 mystical stones, two of which were found by the Young Gods in Central Bend and Ireland. Nauda captured the Sri Lanka team and forced the others to surrender themselves and the stones to him, but Daydreamer created illusionary stones instead. They were able to destroy Nauda by becoming a Uni-Mind, and Caduceus destroyed his stones. (Avengers I#370-371) - Varua was captured by the Deviants and forced by a brain-mine to create a Uni-Mind to power Ghaur, but the Black Knight set her free from their control. (Eternals Annual II#1) - Alerted by the growing Uni-Mind the Eternals Ikaris, Sersi, Makkari, Thena and Ajak went to Madripoor. The Eternals fought the mad Young Gods, who revealed their plan to create a new Celestial from the minds of humanity--the Terran. The Uni-Mind dissolved and all Young Gods lost consciousness due to their telepathic connection to Varua after Legba killed Varua by vaporizing her head with an energy blast. It would seem that Gerry Conway had some big plans for the Young Gods, especially given the major focus they were granted in Spectacular Spider-Man Annual#8 (a team-up story with Spider-Man, a solo story AND a featurette on their origins!). However, the only fruit it bore was the Marvel Comics Presents serial...4 years later.